I'm a GPS junkie and have wanted a differential GPS setup but most of my GPS receivers are so old that they can take differential corrections from an external LF receiver, but don't have an internal LF RTCM SC-104 (Wiki, US Coast Guard: NDGPS) or WAAS (Wiki) differential receiver. It turns out that this model does not support WAAS, but a later version (DGPS MAX) does. The military PLGR and DAGR GPS receivers have provision to use the military version of WAAS, but not the civilian WAAS system. They also do not have an internal LF DGPS marine beacon receiver, but will accept an external DGPS input. It appears that CSI is no longer in business and so far it's been difficult to get documentation on the receiver. 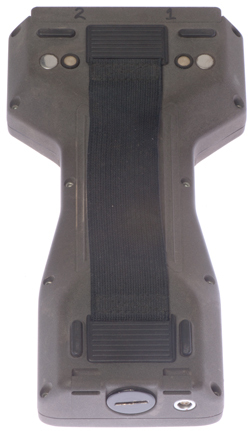 MBX-2 is the basic LF differential correction receiver, no other receivers. MBX-3S is the basic LF differential correction receiver, no other receivers, but has a GPS output and works with the MGL-3 combined GPS & LF antenna for neater cabling. 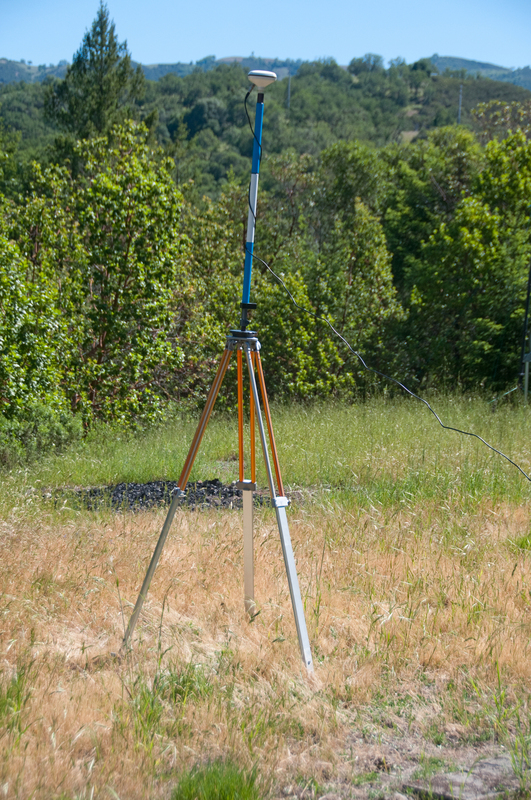 The MGL-3 antenna combines GPS and LF beacons on a single coax. The MBX-3S receiver has a splitter and outputs a signal that goes to an external GPS receiver.. The MBX-3S can take in the NMEA GPS data and display it. 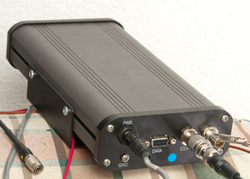 GBX is a combined GPS (8 or 12 channels) receiver plus an internal LF beacon receiver. MGL-3 antenna. LGBX is the GBX plus an L-band receiver for the OmniSTAR differential correction service. 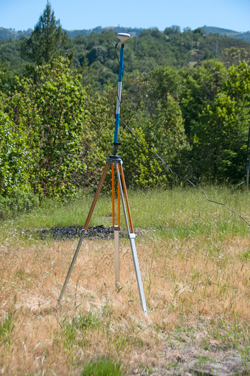 USes the CDA-1 antenna for GPS, LF beacons & OmniStar L-band corrections. The LGBX-Pro has an Ashtech G-12L GPS receiver (Aug2000 $4100) The Ashtech GPS receivers are very good, see the Z12. 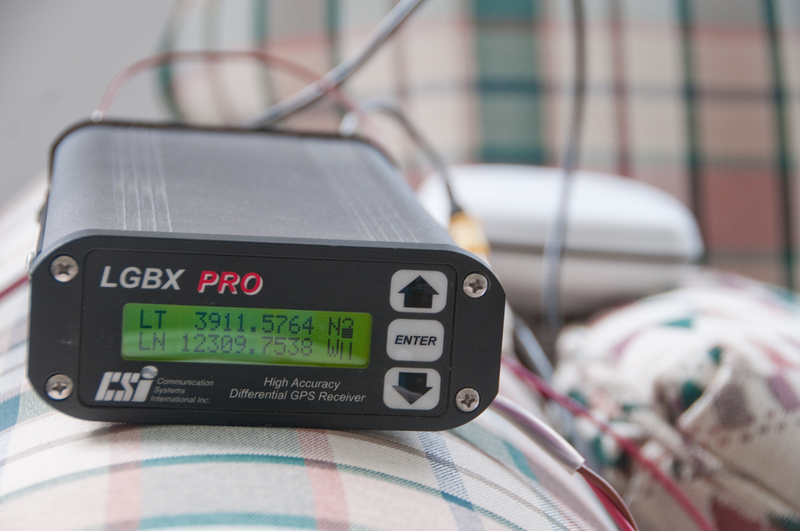 DGPS MAX is the LGBX plus WAAS capability. USes the CDA-3 Antenna that covers: GPS, LF beacons, OmniStar and WAAS corrections. CSI made a number of antennas to go along with their receivers. Note 1: The LGBX Pro receiver has two antenna jacks on the back panel, one marked CDA-2 and the other marked MBL-3. CSI started out making Low Frequency differential GPS receivers and migrated up to making a single box that can receive both GPS and a number of differential corrections such as WAAS, LF beacons or OmniSTAR L1 only corrections by means of a subscription. Some of the GPS receivers they got from others. Note WAAS and the LF beacons are free. 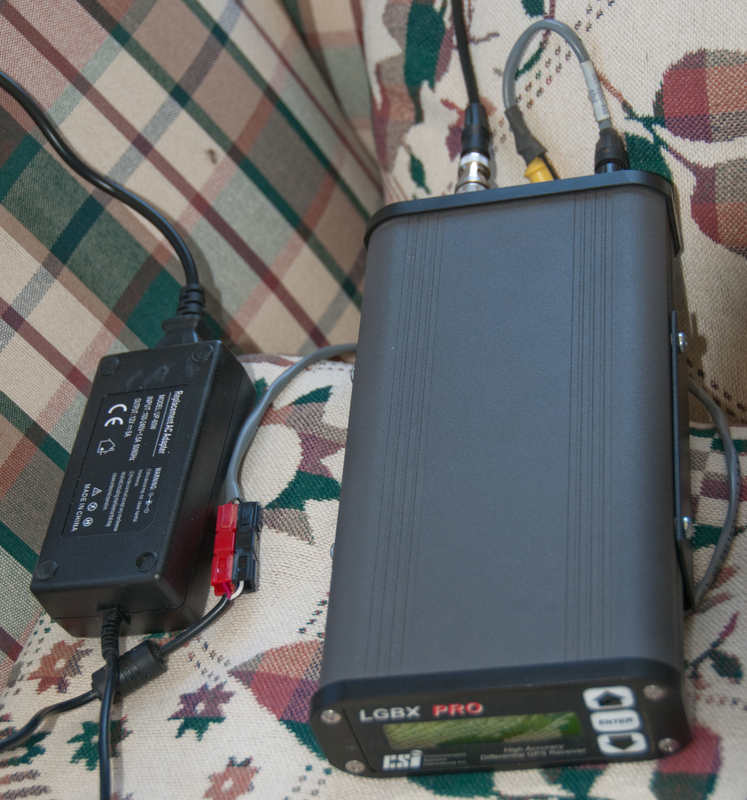 In order to do this the box has three receivers, GPS on the L1 frequency, LF beacon receiver that tunes from 283.5 to 325.0 kHz and an L-band receiver for the OmniSTAR corrections. In a like manner the CDA-1 antenna also covers all these frequencies with an active amplifier and triplexer. I did find a manual for the CSI DGPS MAX receiver that uses the CDA-3 antenna. 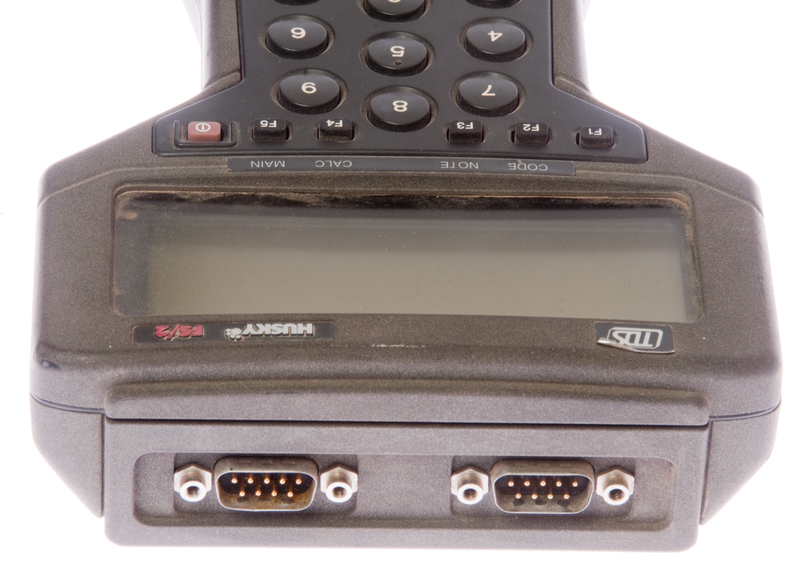 If you have a manual for this receiver or information on the TDS Husky FS/2 Data Collector please contact me. up/dn arrow to select frequency. shows up as Unselected instead of it's name. above it is Ashtech 12 chan GPS board. small board is CSI SBX beacon receiver. The receiver came with a power cable with a small LEMO connector on the far end and I don't know what that fits, so I opened the fuse holder and plugged the fuse into the receiver end of the fuse socket and used an alligator clip to the free end of the fuse and another clip to the chassis of the receiver and applied +12 Volts DC to the fuse and the receiver came to life. I haven't made a movie of the start up sequence, but will shortly. After a short while (to be timed in the future) my Lat and Lon were displayed as shown in Fig 1 above. Note the symbol in the top line which is an open padlock which means no differential lock. The symbol just below the open padlock is a "?" and it's being overlaid with a solid block meaning there's not a good GPS fix. At power up it draws over 1 amp so will not start with the HP E3617A bench supply, needs the HP 6038A power supply to get going. But once running only draws 0.7 amps at 12.0 volts. After playing with the menu system I got to a place where I could choose the LF beacon by it's location and tried Cape Mendocino but no lock then tried Chico and got a lock. I've let the receiver just sit for a number of hours and the Lat and Lon seem to be converging. After the first couple of readings in the table below the antenna cable was changed to a 10 foot BNC cable and the antenna placed outside about five feet from the house. So a little better than inside like for the first line in the table. The last digit in the Latitude corresponds to about 0.6 feet and the last digit in the Longitude corresponds to about 0.46 feet. I have cut off the old power Lemo plug and replaced it with Power Pole connectors. I'm now powering from a laptop type desktop power brick. This gets rid of the fan noise from the HP 6038A power supply. After restarting the LGBX and selecting the Chico LF correction station the beacon receiver did not lock after a few minutes. The antenna had fallen off the 5 gal bucket and was face down on the dirt. But scrolling through the menus it appeared as if the time was correct. Maybe there's an internal real time clock that's either battery powered or it runs off a super capacitor. Also have connected the antenna to a tripod and extension mast. This lifts the antenna off the ground which is both better for the LF signal strength and also for sky visibility for the GPS (more satellites in view). Now the beacon receiver locks in a few minutes as does the GPS receiver. Here the official USCG U.S. list of LF beacon stations. The display has two lines and the far right character in each line is always a status icon. The top line icon is for beacon status. It might be the top of a question mark with a solid block below or a unlocked padlock or a locked padlock. The second line icon might be two vertical parallel lines (| |) when not enough satellites for a fix, to an (H) with an open diamond on the horizontal bar for fix but not good lock to an (H) with a vertical bar in the center of the horizontal bar for a good sat fix. These two icons appear on all menu lines. Pressing Up or Dn arrow changes station frequency, so with a lot of presses you can tune any frequency. This allows accessing a station, such as Lincoln, CA that is not on the built-in station list. There is a long hex number that can be edited. 15 May 2014 - When looking at the Satellite Status page when the number of SV was 7 there was no satellite data, i.e. all the variable characters were zero. Opened up box (See Fig 9 and Fig 10 above) and expected to find a dead battery, but it tests good. After putting it back together still no satellite data. Possible Answer: SV64 is being tested for the new L5 frequency and has it's health set to unusable. If the Ashtech receiver sees the unhealthy status it may turn off the listing for all the space vehicles even though only that one is marked do not use. 6625209 Short synchronization time data modem, Hamid Najafi, Csi-Wireless, Inc., Mar 29, 1999, 375/222 - data modems for systems using 2 GPS receivers for DGPS corrections. 342/357.31, 342/357.41, 342/357.44, 342/357.48, 701/470, - combines GPS and WAAS carrier phase processing. some of the people from CSI have moved to Hemisphere GNSS. CSI made the application in 2004, but Hemisphere has this patent in 2005. Surveying data collectors are used in the field to collect data from either a GPS receiver or a total station so the data can be taken back to the office and worked on there. This is the intersection of Surveying, Navigation and Electronics. The kit of GPS surveying stuff I got on eBay included the CSI LGBX DGPS receiver, this data collector and a couple of cables, the power cable for the LGBX receiver and some flavor of DB-9 RS-232 cable. The TDS data collector has a screw out plug on the bottom that maybe is to hold some rechargeable AA batteries, but I'm just guessing since so far I haven't found a manual for it. I have on order (May 2014) a battery that looks like 3 AA rechargeable cells (Ni-MH) 3.6 V 2700 mAh. Tried 3 AA Ni-MH cells but don't know the polarity and maybe they don't make contact because there's springs on both ends of the battery compartment (maybe to protect from mechanical shock). There also may be a memory backup battery inside the case? 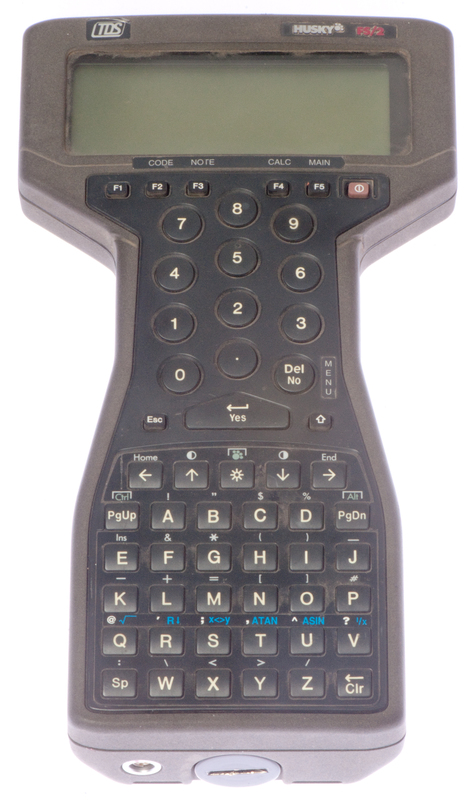 These are pretty much a handheld computer with specialized software to manage GPS & surveying data.